Custom drapes and top treatment add softness and color to this living room, while offering privacy. If it’s time to update the window treatments in your home, please allow me to offer you some advice. With so many choices out there—from brands to styles to colors and materials—it can get overwhelming. But on the flip side, with so many choices available, there is no reason not to find the perfect solution for your windows. As you are investigating your options, make sure to keep in mind functionality as well as beauty. For instance, do you like your room to be dark in the morning? If so, select a window treatment with a room-darkening lining. Some products are described as “black-out” or room-darkening; others are described as “light-dimming.” As you can imagine, “light-dimming” is just that—it dims the sunlight coming into the room, rather than blocking it completely. Only you can decide which option is best for your needs. Another consideration is light control. Are you a person who opens the drapes each morning and closes them at night? If so, then a single-function window treatment is probably right for you. Examples of single-function coverings are drapes, honeycomb shades, Roman shades and roller shades—anything where the covering is either open or closed. These types are great for a number of reasons, but they offer no light control. Dual-function coverings offer light control options. Examples of this type are wood blinds, shutters, vertical blinds, and Silhouettes. With dual-function shades, you can have them completely open or closed, and also have the option of controlling the light by opening and closing the louvers or slats. This can be important for reducing glare on a TV or a computer, and also for providing privacy without blocking all of the light. 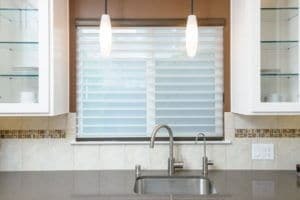 This Silhouette Window Shading offers light control, privacy and a beautiful soft look at this kitchen window. Some clients enjoy the clean lines of the blinds and shutters by themselves, while other clients choose to dress their windows even more with drapery panels and top treatments. Curtain panels, with or without a valance, add a beautiful finishing touch to your windows. Did you know that valances, draperies and curtain panels are more popular than ever? After years of plain windows, clients are back to embellishing their windows with layered window treatments. If you have purchased new window coverings recently, you probably had some sticker shock over the prices. It’s not uncommon to spend hundreds of dollars on one window treatment, depending on the style and material chosen, of course. 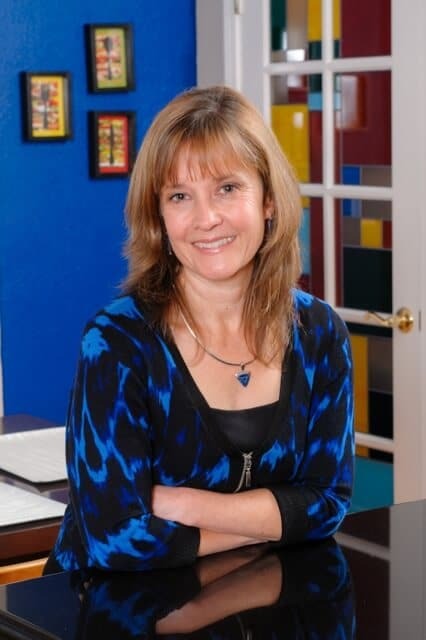 It’s true there are inexpensive options out there—wood blinds, for example, are quite affordable—but I’d like to caution you about purchasing inexpensive knock-off versions of more expensive brands. Knock-offs may be manufactured with inferior materials, leading to warping or fading, or simply not functioning properly. One important difference is the warranty on the product. Make sure to ask about the length of the warranty, and what is covered. How does the manufacturer handle any repairs that might be needed down the road? Is the shade reparable or are you out of luck if something goes wrong? It’s common for higher-priced brands to last years and years before needing any repairs. The most common repairs are for broken lift cords. And fortunately, those are relatively easy to deal with. Plantation shutters provide privacy and light control, and are a timeless look for any room. With inexpensive brands, the warranty may be for only two or three years; higher-end brands offer limited lifetime warranties. What does limited mean? It might mean that after 10 years, some repairs are still covered at no charge, while others might carry a nominal fee. Lifetime warranty can also mean that the blind will never fade or warp. One important note: while the manufacturer might cover the cost of the actual repair, installers will charge to come out to remove and replace the blind, and some dealers may charge a service charge for sending the blind back and handling the paperwork. Even with these charges, repairs should still be more economical than purchasing a new shade. How long will you be living in your home? If you plan to stay awhile, invest in top-of-the-line window fashions. 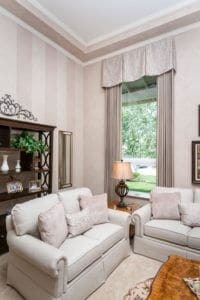 Even if you are planning a move in the next few years, it is important to know that beautiful custom window treatments can be a very attractive selling feature for your home.